We launched FACEIT last month and you guys are loving it! We’ve seen loads of matches played, and we’ve had loads of great feedback for our drafting system. One thing you guys wanted to see more of, though, is FACEIT points. Things were a little expensive in the store, the payout you guys were seeing wasn’t distributed that well and the amount of points you guys were earning wasn’t quite right either. So, we’ve gone back and re-addressed some of the prices and earning rates, to ensure the whole system is rewarding your time more effectively. With the changes we’re going to be ending the Season 1 Ranked Leaderboard immediately, with a Season 2 kicking off at 18:00 BST today (26th September) on the official hubs, which will last for 2 weeks. You guys can now create your own custom FACEIT hubs for Dirty Bomb and play by your own rules! Check out the instructions here to see how it works. We want to make it very possible for you to earn rewards from playing FACEIT, so we’ve completely overhauled how you earn FP and how much these rewards cost. Along with being earn-able, we still want them to be a bit of a challenge, so when someone sees you with a FACEIT skin, they know you fought hard to earn it. Queuing is now solo only on the Official Splash Damage hubs. Stats for Dirty Bomb have been enabled in the FACEIT client. 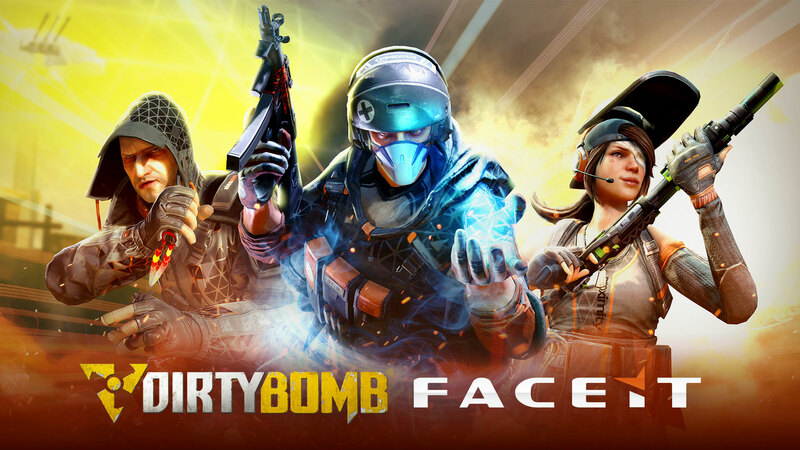 FACEIT Missions for Dirty Bomb will be enabled later in the week which will provide a new way to earn rewards for playing Dirty Bomb on FACEIT. And that’s everything for now! Please do let us know your initial thoughts on these changes. We’ll be keeping a close eye on feedback and will monitor carefully how the new Hub and Leaderboards perform, along with your FP earning. If you want to chat about it some more then had on over to the official forums, and check out our social channels.